Setup: 2010, Venture 164cm splitboard used with Spark bindings, Karakoram clips and Voile skins. Cost: $900 retail. Try looking for a used deck. The weight is an issue with this deck but with weight comes strength. This is one tough splitboard. I find the Helix to be a little too soft. Combine a softer flex and reverse cambered tail and you tend to get backseat on drops with this board. 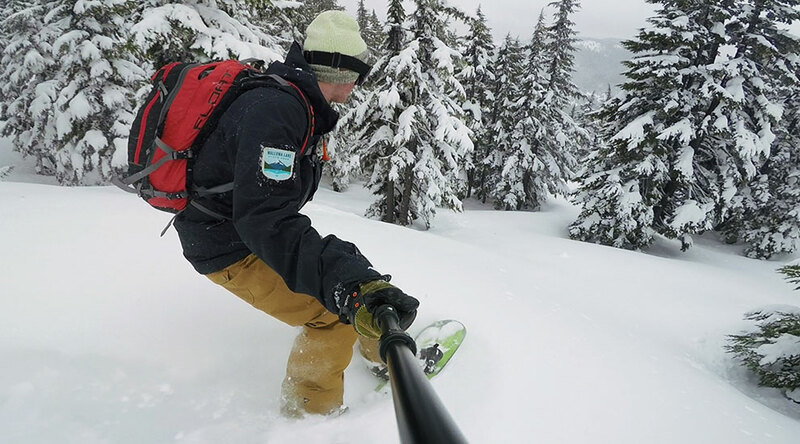 After many years in the backcountry, using sleds for lapping terrain or hiking the side-country, I finally built up a splitboard with a Venture Helix deck. I chose this splitboard deck because of the camber profile and board shape. I wanted a freestyle oriented splitboard and that’s just want the Venture Helix provides, making for an easy transition into splitboarding. The board rides well in descent mode. The rise in tip and tail along with the ample sidecut make for a surfy ride that floats surprisingly well in heavy and deep snow. I’ve been pleased with the deck on deep days in the Northwest. The camber under feet creates secure grip when entering a sketchy line. With a heavy backpack on my back, I tend to get a little backseat with the reverse cambered tail and softer flex. The Venture Helix climbs as expected, no surprises here. The board shape and Venture construction quality is the true selling point of this deck. A twin tip, traditionally shaped deck, that has powder friendly tip and tail and goes up hill. Venture makes good products and after years of abuse, the board is holding together well.